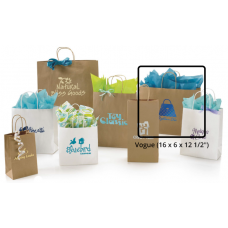 Looking to buy shopping bags in bulk? We can help. Our environmentally friendly shopping bags are made from 40-100% post consumer recycled content. These bags can be customized and hot-stamped with your company logo on the side. 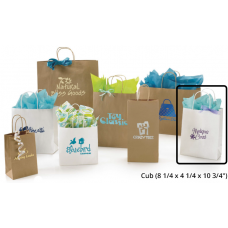 Please note these bags are shipped plain and in bulk, if you require customization please contact us for a quote. All items on our side come with free Canada wide shipping. So if you need bags in St. John's, Halifax, Ottawa or Toronto you can enjoy hassle free delivery to your door or business location. Note: This product is priced per case (250 bags).Description: Coordinate this white bag with solid c.. Note: This product is priced per case (200 bags).Description: Coordinate this white bag with solid c.. Note: This product is priced per case (250 bags).Kraft and white paper shoppers provide an economica.. 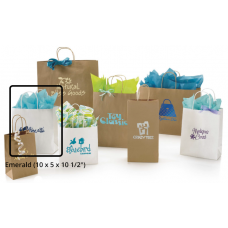 Note: Priced per case (250 bags).Kraft and white paper shoppers provide an economical way to grow yo.. Note: Priced per case (100 bags).Kraft and white paper shoppers provide an economical way to grow yo..